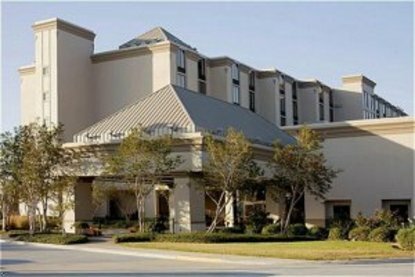 Welcome to the Holiday Inn Baton Rouge-SouthThe Holiday Inn Baton Rouge-South is the largest full-service hotel near the city, located less than 6 miles from downtown Baton Rouge, LA and 13 miles from Baton Rouge Metro (BTR). Our prime Baton Rouge location, near Louisiana plantation homes, puts you near Blue Bayou Water Park and Dixie Landin&reg Theme Park as well as Baton Rouge Town Center shopping. Our hotel&regs recent renovation of 334 well-appointed guestrooms and suites includes a state-of-the-art fitness facility, indoor and outdoor pools, Business Center with complimentary High Speed Internet access and complimentary wireless Internet access in the atrium areas. On-site is the full-service Cafe Galvez Restaurant & Bar, and the Alamo Lounge for after dinner cordials. Room service is available from 6am until 11pm.Our location near downtown Baton Rouge puts us close to: LSU, Louisiana Arts & Sciences Museum/Planetarium, Southern University, the Louisiana State Capital, the Mall of Louisiana, the USS Kidd, the Greater Baton Rouge Zoo, and Casino Rouge.Holiday Inn South features more than 9,000 square feet of flexible meeting space with a special reception capacity for up to 500. Our experienced staff is more than happy to help with all arrangements for your conference, wedding, exhibit or special event&regwe are your first choice in Baton Rouge Relax, it&regs Holiday Inn This hotel is committed to providing accessible facilities under the American Disabilities Act. If your accessibility needs are not met, please contact the Hotel Manager on Duty. Should you require additional information regarding accessible facilities for guests with disabilities, please call 1-800-Holiday (U.S. and Canada) or contact the hotel directly. For the hearing impaired, TDD service is available at 1-800-238-5544 within the U.S. and Canada.